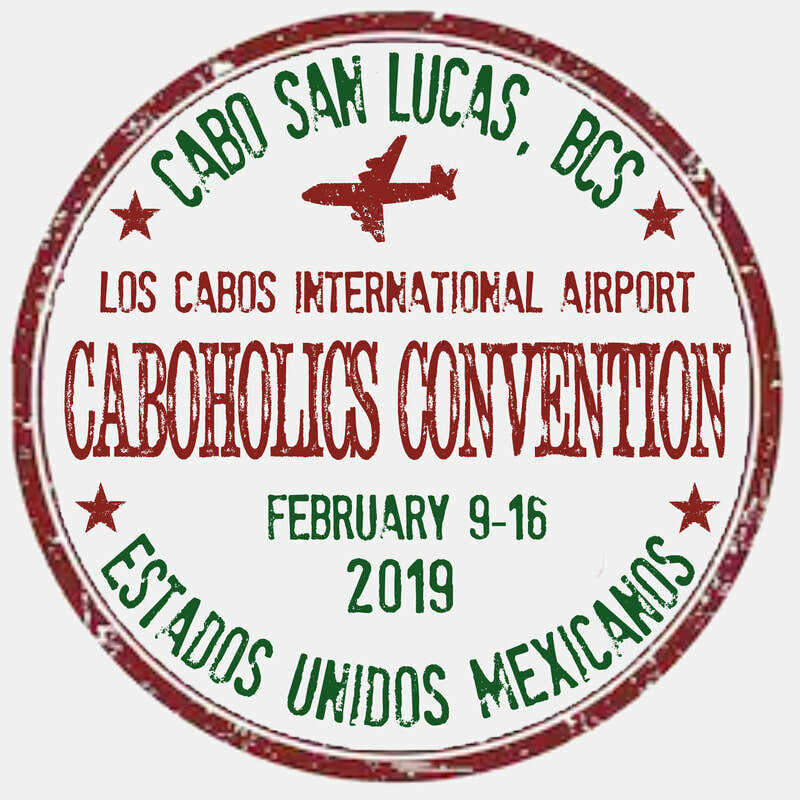 2019 CABOHOLIC CONVENTION REGISTRATION - Welcome CABOHOLICS! 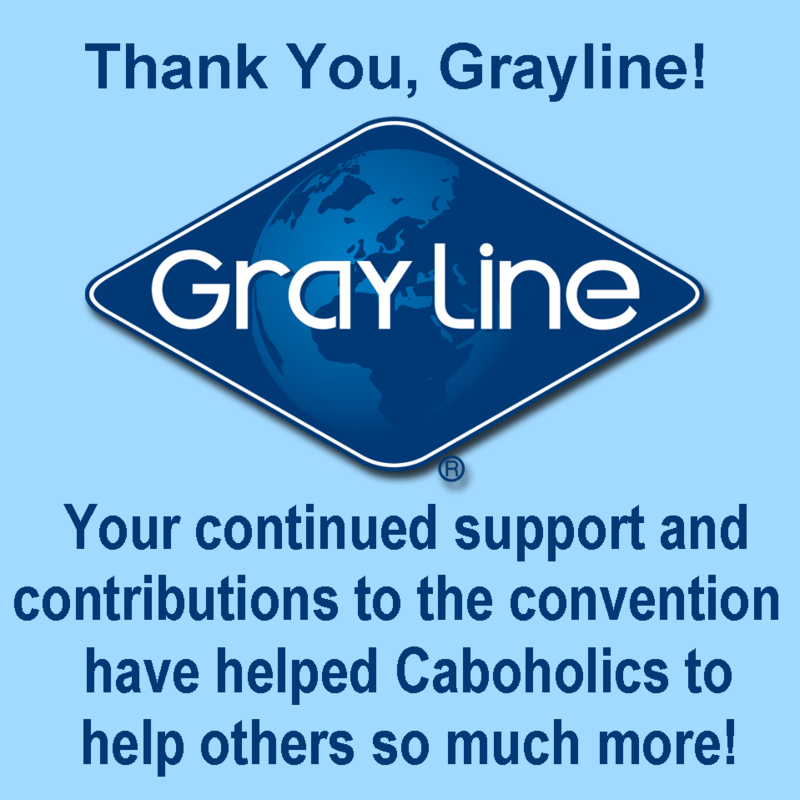 ​If you're coming down for the convention, consider using Grayline for transportation! Caboholics Discount booking online and using code "CABOHOL". CLICK HERE TO SEE ALL OUR SPONSORS! WHAT'S GOING ON DURING THE WEEK? What's going on throughout the week? There will be group activities set up for you to join. Don't feel you have to do all of them ... take some time to relax! To give you an idea of the week's itinary, here's an outline of the activities we've got scheduled so far. There may be a few changes between now and Feb 9th, when the final will be posted. ​If there's something you'd like to do on your own or with a smaller group of friends, Angel, at the Caboholic Store, would be more than happy to set you up. 2019 Convention Registration fee is $11.00 per person. Do not register if you are going to Sponsor, sponsorship includes registration! 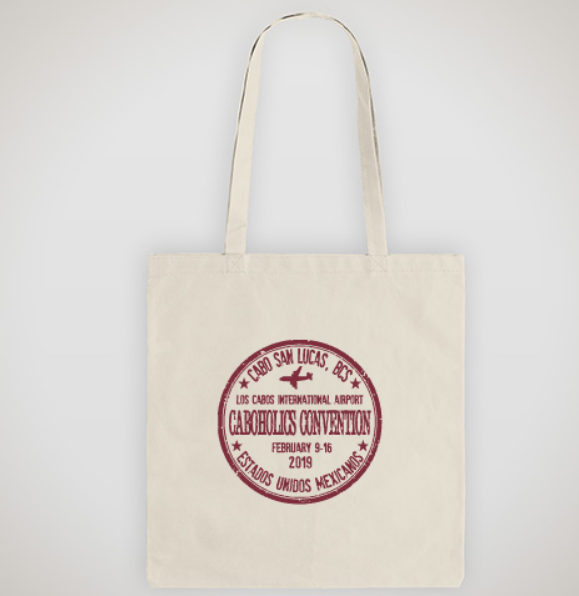 Each registrant will receive a Convention Tote Bag, Convention Button, and Convention bracelet. Once you have registered, you can choose which activities you'd like to attend and book them by clicking "add to cart". Booking as much as you can in the same transaction not only saves time, but also makes it easier for us to keep track of your activities. If you are registering and purchasing tickets for more than one person, please enter the names of registrants. 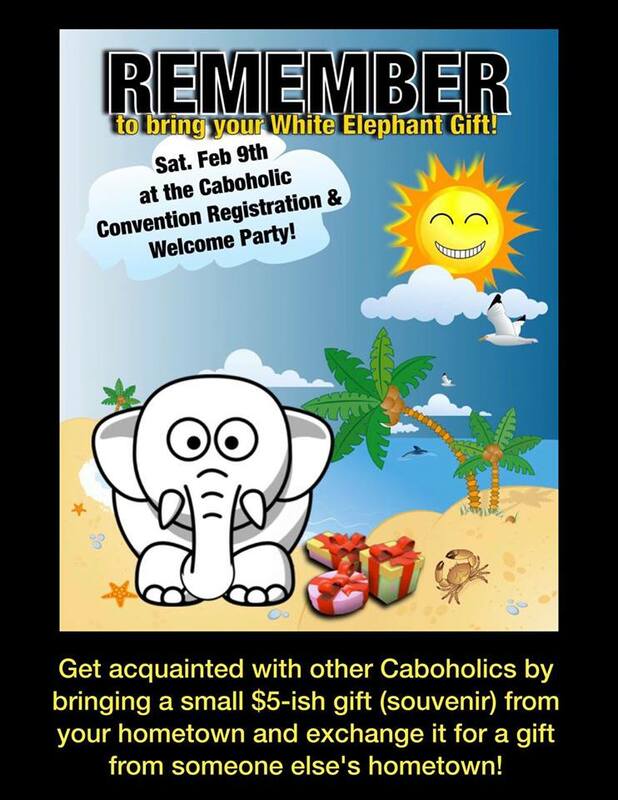 You may also register at the Caboholics Store in person. you may still be able to register in person on Feb 9th. The one event that has helped us raise the most funds to benefit the charities has been our annual silent auction. In years past, we had a dinner/auction night where bids could be placed for silent auction and live auction. This year we will be having the silent auction going on during the Caboholic Cocktail Competion which takes place on Wednesday, Feb 13th from 10:30am - 6:00pm in the Plaza Nautica courtyard, between The Caboholic Store and Cabo Cantina. Bids can be placed throughout the day and auction will close at 6:00pm. You do not have to participate in the Cocktail Competition event in order to place a bid, but you must be a registered convention attendee. As always, your donation of an auction item is greatly appreciated! In the past, we've asked participating businesses to help out with convention expenses but have had so much interest from members to help with sponsorship that we no longer have the need to. We have two levels of sponsorship to offer this year and both include registration fee! 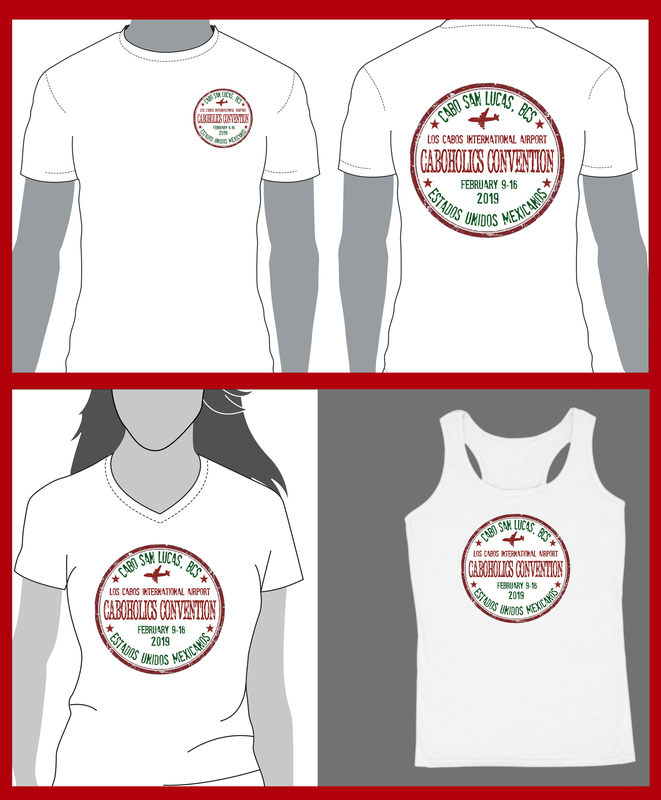 ​Official 2019 Caboholic Convention "Passport Stamp" T-Shirt will be printed on Men's Short Sleeved T-Shirts, Ladies Short Sleeved T-Shirt or Tank Top. One color only - light gray. These t-shirts will be available for pick up only. These will only be available by pre-ordering, so please order before January 28th! YOU CAN STILL GET A CONVENTION T-SHIRT! 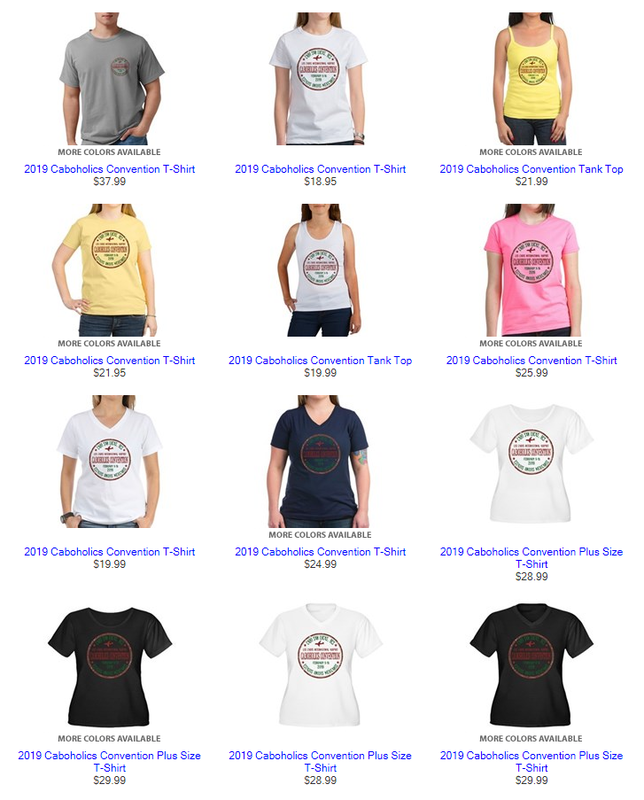 ​If you missed the deadline to order your convention T-shirt and pick it up in Cabo, you can still get a t-shirt from the Caboholics CafePress store where you can choose from a number of styles and colors! 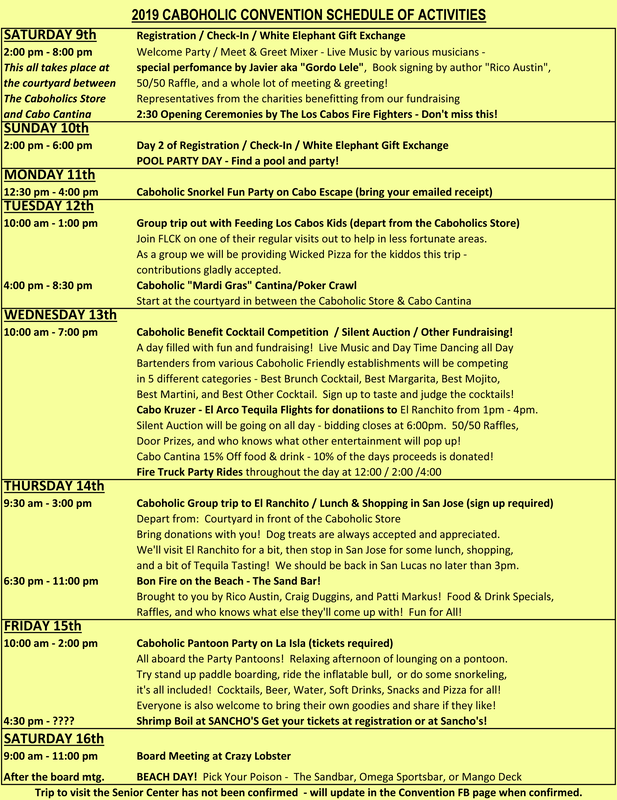 The Caboholic Snorkel Party Cruise on the Cabo Escape has become a TRADITION! Tickets are limited, so book early! Tickets are $20.00 per person for this special day! $5.00 per person will be donated to the charities! Climb aboard, enjoy the open domestic bar, all you can eat buffet, snorkeling (gear provided), entertaining DJ, games, and dancing from 12:30 - 4:00! Tickets for this event are for REGISTERED convention attendees! You'll be booking this activity directly from the Cabo Escape website. Please be sure to print out your receipt and bring it with you to the dock the day of the cruise! Starts at approx 5:00pm - The Cantina Crawl is a walking tour of some of the bars in town, all within a few blocks of each other. During each stop, you'll have time to socialize, and possibly find a new favorite hang out! Each of the bar owners will be given the chance to share any information about their place if they choose. ​One of the funnest activities we do each year! This year's theme is Mardi Gras / Fat Tuesday! All proceeds from the cantina crawl are donated! 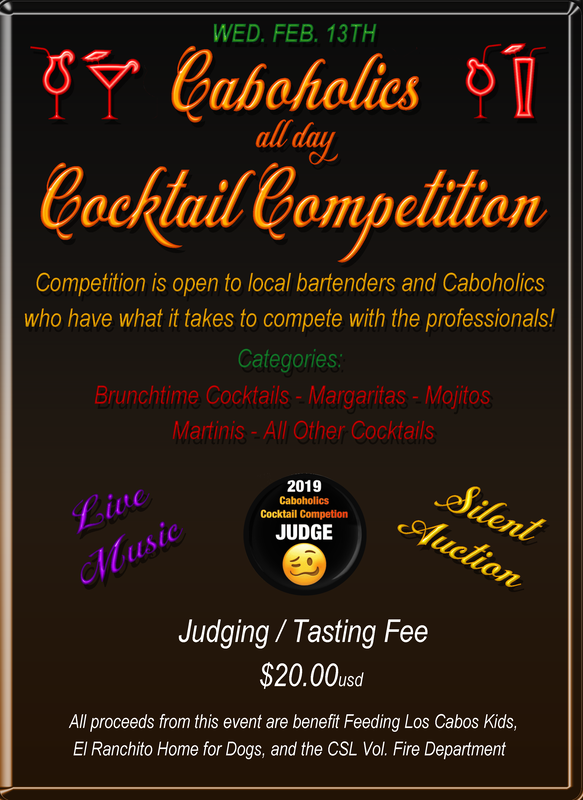 ​We are inviting all bartenders (professional or not) to enter their best cocktail to be judged by any and all Caboholics who'd like to do the judging! We'll have live music throughout the day, raffles, door prizes, games, and silent auction! All proceeds from the Cocktail Competition are donated! Approximately 6:00pm - Departing from Caboholic Cocktail Competion at the Plaza Nautica Courtyard. ​A ride on the Firetruck is more fun than you can imagine! We've done this every year and it's something not to be missed! Sirens blaring as you around town waving at everyone as you ride by! All proceeds from this activity benefit the Los Cabos Volunteer Fire Department. 10:00am - 2:00pm - Las Isla's are pontoon that float over to the arch, back over to the area in front of Mango Deck then docks close to Pelican Rock for snorkeling, swimming, and SUP. We'll have Corona and Pacifico, Vodka, Tequila, and Rum, as well as a few mixers, soft drinks, water, and snacks. You can bring whatever you like as well. Tickets for this are very limited, so get yours as soon as you can. This is not a fundraising event, no proceeds from the Pontoon Party are donated! We'll be heading down to Sancho's on the marina after the Pontoon Party for a good old fashioned Texas Style Shrimp Boil!​ Big enough to share, but you may not want to. Purchase your tickets during the registration. This is not a fund-raising event. During the convention week, you can visit one or more of the organizations that benefit from funds raised during convention week. Find out more about each organization on line by visiting the websites and/or FB pages (links below). If you'd like to join a group trip, please scroll down and fill out the form below. There will be representatives available during Welcome Party and Registration to share more information and answer any questions you might have. ​If you are unable to visit during your stay, you can make a donation online to any of these organizations right here: Click on the amount for other amount options, then click on "to whom" and choose the organization, then click add to cart!